Original blogpost by Alden Phelps, Young Audiences of Maryland teaching artist and musician, written for the Young Audiences of Maryland Blog. My work as a teaching artist focuses on collaborative songwriting with children. 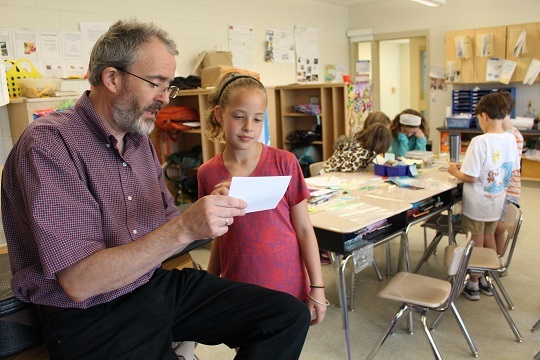 The goal of my recent residency at Triadelphia Ridge Elementary School was to teach seven different classes of third and fourth graders how to create parodies of current pop songs that show their knowledge of science and history. Teaching musical parodies is a great way for students to learn because it’s an opportunity to share their knowledge in a creative way. Students synthesize their knowledge of specific subjects with poetry in a song. There are several layers of learning going on, including using their knowledge of the curriculum, organizing ideas, and employing multiple Language Arts skills. I worked directly with Triadelphia’s teachers to strategize how to address their needs through music by discussing their most recent units and the related curriculum standards. My customized arts-integrated residency addressed what the teachers wanted to focus on, namely a third grade unit on earth science and a fourth grade unit on Maryland history. The goal is always to reinforce what students have already learned through this new artistic skill. The advantage to using current pop songs such as “Shake it Off” or “All About that Bass” is that the kids recognize the tunes immediately. I do background work to make sure all the songs will work in this unique collaborative project. Students always express an immense level of enthusiasm whenever I walk in with a list of handpicked songs they could use for their parody. For example, Mrs. Russell’s third grade class chose the hit “Call Me Maybe” by Carly Rae Jepson for their parody about weather patterns. In the end, their song was titled “Save My Granny,” and it describes several different extreme weather patterns in a clever and funny way. I began by teaching the children basic elements to songwriting and composing. We did this by counting the number of lyrics, verses, and choruses of their song choice. Through this analysis, we discussed each song’s use of patterns, syllables, rhythms, and accents. I then divided the children up into writing teams so that they could begin building the verses of their songs. This activity is always a great teaching moment because it challenges students to collaborate, share, and compromise with one another while being creative. I spent time with each writing team and coached them through the creative process. While they worked independently, I provided them with rhyming dictionaries and was surprised by how quickly they dug into those books! Rhyming at that level is a fairly difficult skill for children to master in such a short period of time. The writing process is always satisfying to me because I get to witness students discover a whole new world of words they may not have even realized existed. I often came across students who struggled to find rhyming options with difficult words. But then, just like that, a kid would blurt out the perfect lyric that would fit. A line would just tumble out of their mouth and I’d shout “Yes! That’s it!” In response, they would light up with excitement knowing that they had the answer within them all along, they just had to let it out. In one of my classes, there was a child who consistently struggled with behavioral issues. During this residency, he collaborated well with others and even wrote a clever lyric which became the opening line of the parody. Collaborating with the team was a huge step for him. As final preparation before each group was to perform their parodies for the school, students typed up each song’s verses with the teachers, practiced singing their lyrics, and made final tweaks to the lyrics, changing a word here and there. Before their eyes, songs emerged–there’s always electricity in the air when a class suddenly realizes what they’ve achieved. The Triadelphia students were so proud of their final products and knew that they had created something clever and unique. Because children spend so much time with their peers in schools, I believe that it’s important for them to interact with many different kinds of people, including artists. Artists are a unique breed–if nothing else we have a different perspective on the world, and through the arts, anyone can see through different eyes.Creativity is a way of seeing life from different directions and a way to find a thread connecting disparate ideas. The way artists go about solving problems and finding meaning is important for children to experience. It gives them opportunities to see through new eyes, and speak with a new language.